We have a set of four modern chamber compositions, two each by David Lumsdaine (b. 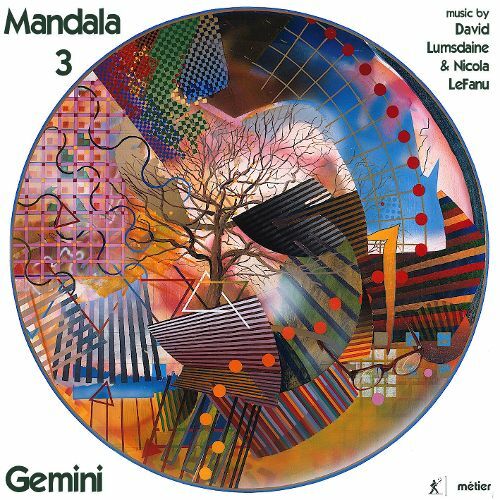 1931) and Nicola LeFanu (b, 1947) on the CD Mandala 3 (Metier 28565). They are well performed by the chamber ensemble Gemini, which is directed by Ian Mitchell. The program begins with the somewhat whimsical LeFanu "Invisible Places, in 16 continuous sections" (1986) for clarinet and string quartet. Next follows a short "fire in leaf and grass" (1991) for soprano (Sarah Leonard) and clarinet (Ian Mitchell) by Lumsdaine. The mood is carried over to the more lengthy and involved LeFanu song cycle "Trio 2 - Song for Peter" (1983) for soprano, bass clarinet/clarinet and cello. It is an effectively moody piece in a modernist chromatic, advanced-harmonic zone. Last but not least on the program is the forty-minute Lumsdaine work "Mandala 3" (1978) for chamber ensemble featuring Aleksander Szram on solo piano. It is an extension and flowering outward of Lumsdaine's (1975) solo piano work "Ruhe sanfte, sanfte ruh." Both are based on the movingly beautiful final chorus of Bach's St. Matthew Passion. "Mandala 3" in the composer's words is a "more extended structure which further explore[s] the harmony of Bach's chorus in terms of style and layers of textures." It is all divided into three parts, the first is a transcription of the chorus as a classical quintet, which sets the tone for what follows, a sonata continuously flowing out of part one, developing the music into something still related but other, then even more modernly other. Part two dissolves into the "Ruhe sanfte, sanfte ruh" piano section (i.e., Part three), an extended fantasia that centers on the piano rapture surrounded by the chamber ensemble that echoes, then states the chorus theme once again. Like Foss's "Baroque Variations" the classic themes are recontextualized and stylistically refigured into later style zones. But Lumsdaine does it differently and originally. It is an eerie, masterful work both with Bach both inside it as it were, and outside of it looking in. In the end it is neither quite out of the neo-classical Bach filtered zone nor quite sturdily situated as a modern commentary. In is both and it is a joy to hear. "Mandala 3" makes this program very desirable; the other works give much contrasting interest. In all the album provides much pleasure and a good taste of what Lumsdaine and LeFanu have been doing. I am glad to have it to repeat the experience, probably many times. Of all the avant jazz artists who have turned to new music composition, trombonist George Lewis is among the most rewarding and successful. He started as a key member of Chicago's black collective AACM (Association for the Advancement of Creative Musicians) and then saw greater exposure as the trombonist in Anthony Braxton's breakout small group. He was an important component of many avant jazz ensembles that followed, including his own groups, ended up a professor at Columbia University and is now Vice-Chairman of the music department, where his interest in electronics and experimental new music composition as well as his continued involvement with avant improvisation have found an institutional outlet and ever-increasing recognition. 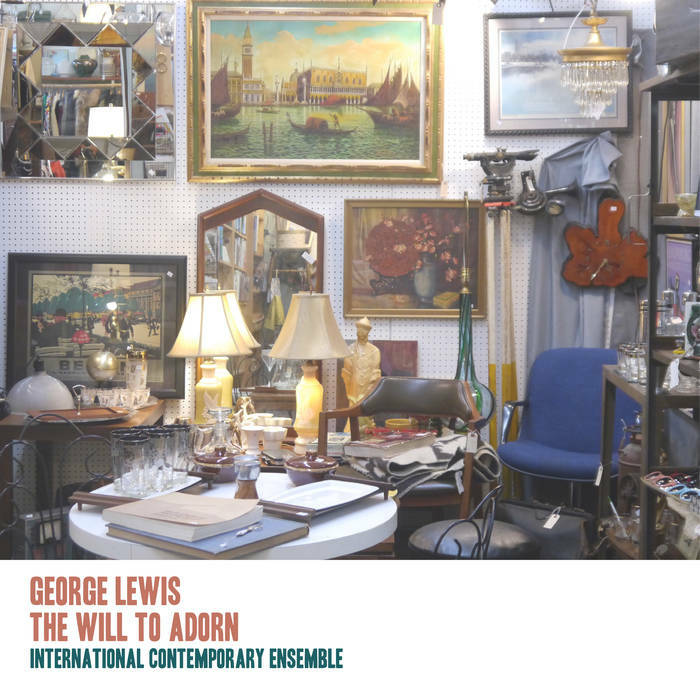 Some of his vibrant new music compositions are given near ideal performances by the International Contemporary Ensemble on a new CD entitled The Will to Adorn (Tundra New Focus Recordings 005). This is beautifully contrapuntal new music that preserves the pointillist and timbral liveliness of the best avant jazz ensembles and transposes it all into written works that demand precision and commitment to an expression at once Afro-American as well as international. "The Will to Adorn" (2011) leads off the set with a putting into musical terms what Zora Neale Hurston named as a primary characteristic of Afro-American expression in a 1934 essay. Dr. Lewis achieves in beautiful ensemble intercomplexities what Hurston described as a "decoration of a decoration"--in nearly infinite spilling over of counterlines on counterlines. ICE brings it all to us in exciting ways. From there we experience three more chamber works that vary the musical utterances and instrument combinations but stay within a super-variational context. And so we hear and appreciate "Shadowgraph, 5" (1977), "Artificial Life 2007" (2007), and "Born Obbligato" (2013), exciting ventures into the new. To top off the program George Lewis's unaccompanied trombone has a solo highlight on composer T. J. Anderson's "In Memoriam Albert Lee Murray" (2013), the latter a writer of insight into Afro-Jazz topics. The jazz tradition is encapsulated and celebrated in this short work, which reminds us of course what an excellent artist Lewis is in the instrumental realms. And so we come to the end of a beautifully composed and executed volume, giving us pause and good reason to consider George Lewis as one of our leading American composers today. Any modernist follower, modern Afro-jazz fan and new music champion should find this music as I did, vital, extraordinary and a beautiful listen. 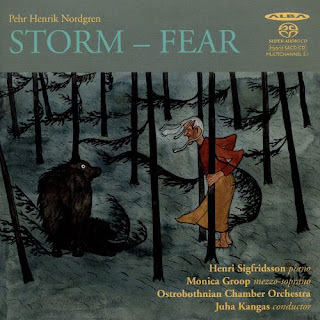 There is a very dramatic component to the later music of Finnish composer Pehr Henrik Nordgren (1944-2008), at least as far as the three orchestral works on the recent release Storm - Fear (Alba Super Audio CD 399) are concerned. His is a high modernist, expressionist approach that breathes with arcs of narrative power. The two concerted works, "Concerto No. 2 for piano, strings and percussion Op. 112" (2001) and "Concerto for piano left hand only and chamber orchestra, Op. 129" (2004) nicely showcase the dedicated interpretive poeticism of pianist Henri Sigfridsson and the Ostrobothnian Chamber Orchestra under Juha Kangas. The mutually rewarding relationship of the composer and the orchestra during his lifetime leaves us with performances that sound most definitive. The "Song cycle to poems by Edith Sodergran for mezzo-soprano, strings and harp Op. 123" (2003) features the moving vocal performance of Monica Groop. All three works have a somewhat dark demeanor, punctuated by glimpses of sunlight. Nordgren's sure hand and paramount mood-setting give us a strong wordless series of story lines (paralleled, of course in the song cycle with the poetry declamation) that contextualize the extended modernist palette in very personal ways. This is not so much a music of virtuosity as that of character. All who bask in modernist tone painting will no doubt find this disk of high interest. Nordgren deserves remembrance and celebration, and we get the chance to do both in this highly attractive program. Those who like me revel in the cathedral organ and at the same time respond readily to high modernism in this context (for example in the organ music of Messiaen) will find the recent release of Axel Borup-Jorgensen's Organ Music (Our Recordings 6.220617) quite appealing, a sophisticated trip into an organic cosmos both mysterious and bracing. He was born in 1924 in Denmark, grew up in Sweden, lived a quiet but productive life as composer and teacher and left this world in 2012. Originally primarily a pianist-composer (type his name in the search box above for a review of some of that), he became increasingly attracted to the organ, happily, since the current release contains nine works that stand out for their contrasting quietude and energy, their subtle shifts and cosmic openness. This is a music of matter-of-fact suchness rather than virtuoso complexities. Part of that has to do with Axel's insurance that the works would be well performed by very competent players who were not necessarily leading technicians. The nine works on the CD include three for organ alone, one for organ duo, one for cembalo and organ, two for organ and percussionist, one for alto and organ and one for bass and organ. "Winter Music" for percussion and organ makes use of the cathedral space for some dramatically resonant drums against a searching organ. That one is perhaps the most dramatic but Jens E. Christensen's careful attention to detail and sympathy for the Borup-Jorgensen universe ensure that we are immersed in a sonic wash of sound that is as extended in modern realms as it is unassumung. This is not music to overwhelm the senses or shock. 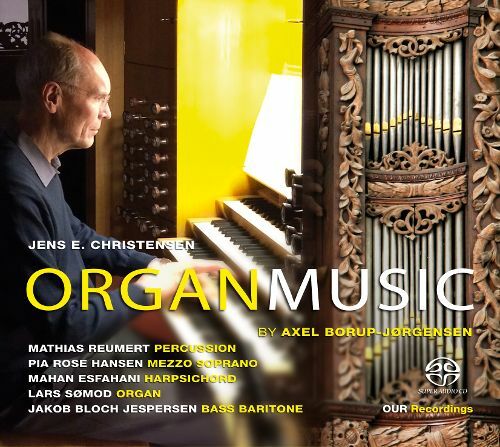 It is a very personal journey into Borup-Jorgensen's exploration of sonic and textural possibilities latent in the modern cathedral organ. 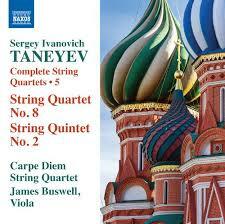 From what I have heard thus far, Sergey Ivanovich Taneyev (1856-1915) and his String Quartets make up a body of work unsurpassed in pre-modern Russian chamber realms. Not until Shostakovich and his quartets would we have anything comparable. A while back I covered a volume of the Carpe Diem Quartet's version of the Taneyev cycle (type "Taneyev" in the search box above for that). Now I return with their Complete String Quartets 5 (Naxos 8.573671), which covers Quartet No 8 and, with the addition of James Buswell on viola, String Quintet No. 2. This, I assume the final volume in the series, affirms both Taneyev's largely unheralded stature in the quartet literature and Carpe Diem's authoritative performances. Quartet No. 8 is filled with marvelous contrapuntal inventions, sounding for all generalities as a sort of Russian Beethoven in the late romantic-pre-modern zone. Anyone who might appreciate previously unknown, extraordinarily crafted and spirited quartet-quintet gems will readily take to this volume 5 in particular and all five in general, from what I have heard of them. Taneyev is but one, yet nevertheless an important one of the too little examined treasures of the Russian 20th century as a whole. Recommended for chamber music fans and Russophiles! Those who are actively inclined toward music have experienced pieces that somehow go beyond what words alone can express, leaving a palpable something behind that has great meaning. So-called serious music, classical or jazz especially, does this exceptionally well. I have a relative who can only appreciate music with lyrics, songs. This essentially closes her off to the most sublime moments that music can give us. That is sad. What such people miss! Of course (and thankfully for the rest of us) those more dedicated to musical arts know and grasp the deeper communicative levels instrumental music can convey. We are the lucky ones and I thank the heavens every day for that. We can appreciate the musical equivalent of "tweets" (when done well) or the complexities of a long musical "novel." There is so much more available to the sensitive listener and you are my audience, surely. 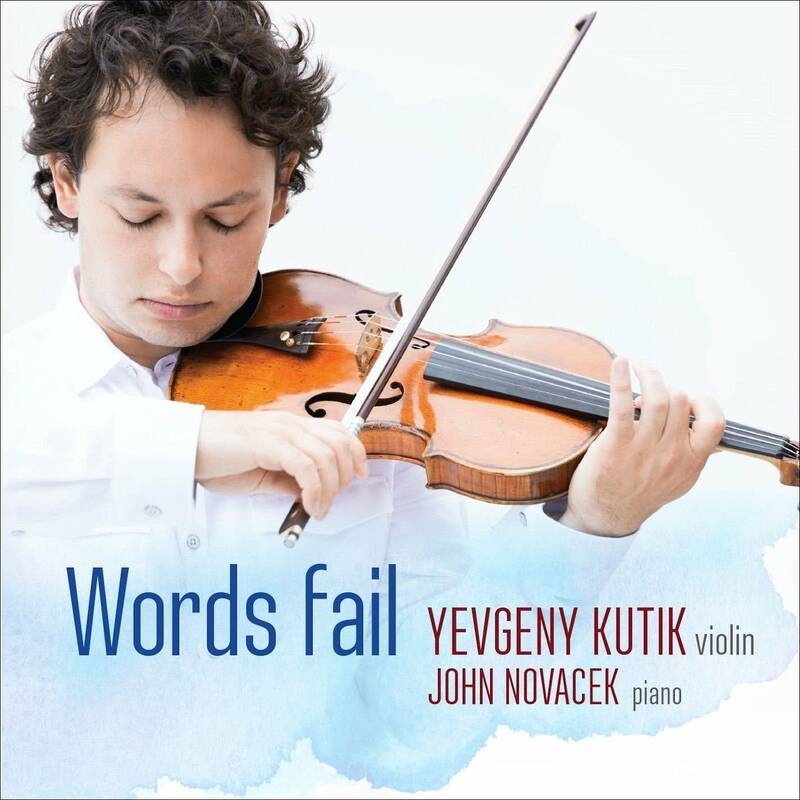 Violinist Yevgeny Kutik and pianist John Novacek have put together a wide-ranging program of duos which communicate in this way on the album Words Fail (Marquis 774718147721). The results play themselves inside your head with varying degrees of urgency, but all "say" something profound with notes alone. We begin auspiciously with three of Mendelssohn's "Songs without Words" arranged for violin and piano by Friedrich Hermann. These are paradigms of song forms that use melody alone to communicate moods to the listener, and in so doing leave a distinct impression. Next up is the Adagio from Mahler's "Symphony No. 5," a heartfelt, searchingly poetic utterance that when translated to violin and piano by Robert Wittinger seems all the more direct. Two world premiere recordings follow: Michael Gandolfi's "Arioso Doloroso/Estatico," a very expressive mood piece for unaccompanied violin; and Timo Andres' "Words Fail," which winds itself out as a central rhythmic motif joins a varying sequential melodic-harmonic pattern that seems perhaps melancholy or regretful but is complicated by its non-literal nature. Tchaikovsky's own "Song without Words" (here arranged by Fritz Kriesler) has like Mendelssohn's series by that name a definite litero-evocative subtext that one senses gladly. Following the program we next hear Prokofiev's rather rare "Five Melodies, Op.35bis." Prokofiev nearly always strikes me as a musical mind that can via instrumental utterance communicate intricate, multiple feeling complexes quite beyond verbal description. That is much the case with these five movements. Wonderful music to hear! Further on in the modern zone is Messiaen's "Theme et variations," with his own complex rhythmic-melodic-harmonic sense, creating meaning with fully dense language that goes far beyond the verbal. Kutik comes through with an especially inspired performance. Lera Auerbach, a living force in composition and string playing whom we have familiarized ourselves with on an ECM recording a couple of months ago, makes a lovely appearance with her "T'filah (Prayer) for solo violin." The musical-speech aspect of this work is pronounced, though of course we get no voice nor verbal equivalence. It is haunting. Kutik's sweetly expressive power on the violin is exactly what all this music demands. He never flags but soars and whispers his way through the music like the young master he is. John Novacek (and Timo Andres on the title piece) give pianistic structure and a unwavering poetic concentration as perfect foils to Kutik's eloquence. This program comes at you like a breath of springtime air, just sweet enough to evoke complex associations but never evoking outright sentimentality. I have been schooled in the thought that everything in life is related to everything else, to look at social life systematically. At the same time I grew up in an environment that believed strongly in the idea of progress. So to me the most modern art, the most modern music was to be sought out and experienced. My attraction to science fiction classics and the futurism of the '50s outlook reassured me that the future was going to be better, with the exception of the classic dystopias of 1984, Brave New World, or H.G. Wells' Time Machine. But even then everything worked, there was no noticeable poverty, and government control in various guises was the main negative force. Gradually the future unfolded and yes, we have a great deal of technology in our everyday lives, but like Blade Runner the stubborn messiness of the past, the decayed nightmare of inner cities, strife between political parties and world religious fundamentalists have a huge role to play in the world arena. Much of this infiltrates all of our daily lives. And often enough at the economic fringes the technology doesn't work because capitalism has moved on with newness and ignored functionality? So we go. I start my morning on a temporary computer hookup that is extraordinarily erratic. Here I am one hour and forty minutes into my blog writing and I've managed to find the proper cover art and download it, only to experience multiple glitches and freezes while attempting five times to write an opening sentence for this article, each one automatically deleted via a cursor defect. Now finally I have success, only my frustration gives me the impetus to vent on this future I no longer like. My partner attempted to eat the 2015 dated oatmeal we got from the food pantry (our more kindly version of what was the bread line during the depression), eventually threw it out and here we are at the edge, the periphery of modernity and, really, nothing is working from where we sit. Our leaders say "we hear you, we'll fix everything" and then proceed, some of them, to give even more to the rich and so it goes. The rich must be placated with more money, the idea of trickle down posits, so they can be in a better mood and so more inclined to help those who may well do without. OK. Yet I still believe in the future, in modernity, and so I also out of habit and appreciation respond favorably to the experimenters, those who go boldly in music where the vast majority of musical humanity has never trodden, not at least until the turn of the last century when humanity found musical wunderkind who opened up the fertile vistas of harmonic, rhythmic and melodic possibilities we as a species had never considered before. 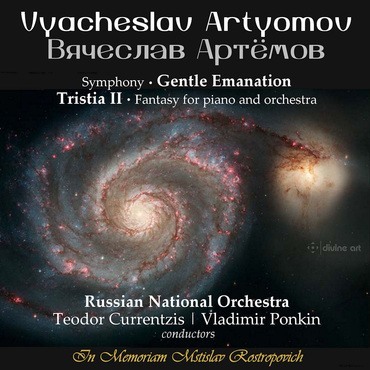 And for all that intro I do introduce a new (to me) high modernist voice, from Russia, one Vyacheslav Artyomov (born 1940) and a CD of two choice orchestral works, Symphony Gentle Emanation and Tristia II, Fantasy for piano and orchestra (Divine Art 25144). Surprise! This is a fully developed voice in new music, someone who has carried over the mysterious cosmos of late Scriabin and Messiaen and made something new out of the unrealized potentials that lurked behind those composers's most prescient creations. In spite of my grouchy social-critical beginnings today the music of Artyomov truly speaks to me. He has a full grasp, a vision of the modern orchestra and what he might make it do, and on these two symphonic works, two sides in a way of his vision, he combines brash and bracing dissonances punctuated by mysterious ruminations on the universe in play, at work, simply being in all its shining glory and mystery, its endless processual flux that presumably has purpose that we only have a dim idea of in our religions and our science, an idea of our place in it that we continually confront with the facts and revelations that humanity thus far has managed to gather about ourselves and the cosmos. That to me is fundamental to the modernist project, in music a sonic analog of what we do and do not know. That is what Artyomov speaks to me, in elegant and vivid eloquence. The Russian National Orchestra under conductors Teodor Currentzis and Vladimir Ponkin bring this complex and very personal music into vivid relief against the seeming silence of the universe. Artyomov is a Russian who travels in the wake of those before and manages to say something new and different. That is a remarkable achievement and he most certainly deserves a hearing. All you modernists and seekers of the new look no further, at least today. Give a listen to Vyacheslav Artyomov on this very moving sample of his work. It gives us another way to thread the futurist needle. 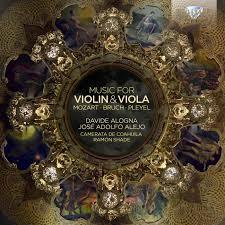 For those fascinated by the intermingling of violin and viola in a duo setting, we have a worthy CD release by Davide Alogna and Jose Adolfo Alejo, on violin and viola, respectively, titled simply Music for Violin & Viola (Brilliant 2-CD 95241). One CD consists of unaccompanied duets; the other features concerted works for violin, viola and orchestra, the latter adding Camerata de Coahuila under conductor Ramon Shade. The Duo CD features a nice mix of music from classical to modern times. Mozart's 15 minute "String Duo in G K423" sets the stage nicely, followed by Martinu's "Duo No. 1 H313," Spohr's 22 minute"Grand Duo, op. 13," Manuel Ponce's 14 minute Spanish tinged "Sonata a Duo" and John Halvorsen's classical-modern "Passacaglia on a Theme by Handel." The various periods and styles are well in hand with a nice blending and lively expression by the two virtuosos. It is interesting to hear how each composer situates melody and figuration to create an individual fullness and balance of ranges, and for how the two artists create a balanced articulation between figure and ground or polyphonic totality, depending. The concerted CD features two relatively obscure and one well known example. Pleyel's "Symphonie Concertante in B flat B112" has plenty of classical dash, Bruch's "Double Concerto in B minor, Op. 88" rachets up the expressive temperature a few notches in a post-Beethovian manner, and Mozart's "Sinfonia Concertante in E flat K364" has a near perfection in form and inspiration that justifies its iconic status. Alogna and Alejo give us an almost reverent reading and the Camerata de Coahuia sound convincing and on the mark, as they do throughout. In the end we have a wealth of wonderful showcases for violin and viola, played with the emphasis on faithful and spirited execution. From 2005 to 2008, in the waning years of his life, American electronic music titan Tod Dockstader (1932-2015) worked out some vibrant ideas in his studio. They have been culled from thousands of files he left behind, chosen for their provocative, yet relatively finished state. No doubt Tod might have sequenced these or in some other manner tied some or all of these into a long-form work, but then again they each have the completeness of a member of a set of preludes or etudes, nocturnes or what have you. In the form of 15 short works that in various ways share a certain trajectory, timbral fullness or directionality they do not in the end sound tentative as much as microcosms in a last cosmic macrocosm. One is struck upon repeated listenings with how very musical these pieces are. Everything has complexed pitched relations with everything else, and the timbral contrasts and confluences make for near symphonic chamber resonances. Tod has always been a master of transformations. In the end each sound complex defies simple reduction to a set of sources, just like a finished score in performance, when of a high caliber, speaks wholly and timelessly without concern for the real-time creation of each vertical or horizontal phrase. 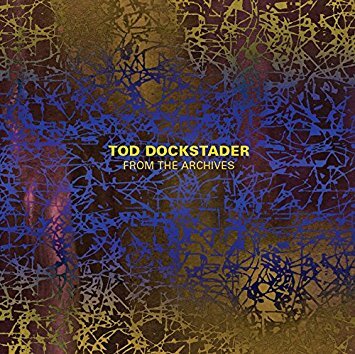 You accept it as each a one and each a complete sonic utterance, even though Dockstader might well have applied additional combinatory logics on what we have as the whole. The richness of extraordinary sound takes over your listening consciousness with vivid and continuous sound imagery that in the end maintains a poetic totality. Wonderful music, this. Tom Steenland and his Starkland label are celebrating their 25th year as a continuously active presence, a bellwether for what directions new music has taken over these epochal times. Tom himself has notched 40 years on his belt as producer of new music, so it is a double-milestone year. Like the purveyor of a cutting-edge art gallery, Tom has had an enormous influence on what we recognize as new and pathbreaking. Sample his extensive catalog and worlds will open unto you! We salute the Starkland label on their 25th, and Tom himself on his 40th! 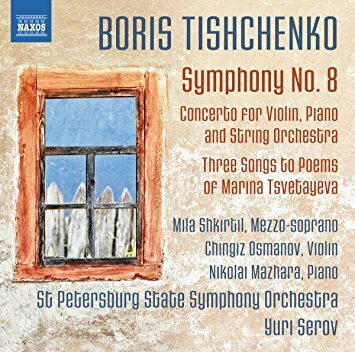 Any of you Russophiles who like me have missed Boris Tishchenko (1939-2010) and/or his last symphony, here is your chance. He studied with Shostakovich and has a modernist-severe rhapsodist, bracing quality like Shostakovich and Prokofiev before him. And he takes it all in his own original direction. You can hear good performances at the Naxos price on Symphony No. 8 (Naxos 8.573343), a 2008 work which enjoys its world premiere here. You also get the characteristic, modern-laced "Concerto for Violin, Piano and Orchestra" (2006) and the premiere recording of the chamber orchestra version of his "Two Songs to Poems of Marina Tsvetayeva" as orchestrated by Leonid Rezetdinov (1970/2014). All sounds well in the hands of Yuri Serov conducting the St. Petersburg State Symphony Orchestra. Guest soloists Mila Shkirtil (mezzo-soprano), Chingiz Osmanov (violin) and Nikolai Mazhara (piano) fulfill their roles with commitment and charm. Surely none of this is filler. All three works show Tishchenko in full bloom, with brooding Russian power and lyricism as needed, but never a speck of sentimentality. He and this disk are not to be missed! From Albion, the audio production arm of the Ralph Vaughan Williams Society, we have Purer Than Pearl (Albion 029), a collection of songs and duets, some quite obscure, dating from between 1891 and 1927, concluding with a selection of songs from the opera The Poisoned Kiss. Vaughan Williams' first songs are firmly in a romantic realm. They are fascinating but mostly uncharacteristic. From 1901 and the song "Linden Lea" we come into familiar Vaughan Williams territory, songs with hints or direct use of folk material, lyric gems, some with the mystery of mature Ralph. These comprise around 3/4 of the album and will be manna for the Vaughan Williams aficionado. Most are for single voice and piano, some are duos and a few include a violin part. The vocalists seem generally well-suited to the music; William Vann does everything right with the piano parts, as does Thomas Gould for his four appearances on violin. This is not precisely an essential disk unless you are a Vaughan Williams completist. Nevertheless it will enchant you much of the time if you let the music into your experience. Around 1975, I believe, I purchased Meredith Monk's first album. I took a chance without knowing exactly what to expect, but was confident that if JCOA New Music Distribution was involved, it was going to be interesting. That album featured her chant-like vocals and rim-rubbed glasses. I was intrigued. Now some 40-some-odd years later, she has continued to flower and develop. The latest, On Behalf of Nature (ECM New Series 4612794), is a masterful set of compositions featuring her wordless vocals, "primordial utterences" as she calls them. The music is now mostly scored for a chamber vocal group and various instrumentalists, further realizing her unique ritual music at the edge of minimalism yet uniquely, originally situated to sound like nothing other. As always Meredith's music does not quite sound "Western," nor does it comfortable fit into an "Eastern" framework. It is as always wholly original. Nature in all its permutations forms the overarching thematic presence, mostly in a primordial. elemental state. Some pieces use a full arsenal of instruments and vocals for her uniquely crystalline, transparent soundscapes. Others utilize smaller, more intimate vocal-instrumental combinations. For no better word this is music of the spirit, in the widest overarching sense. It is modern in that its primordial roots have no actual forebears, except in Monk herself. It is rather easy to accommodate to if you have immersed yourself in ambient music, assuming you make some effort to focus on each piece with undivided attention. The payback is real, palpable and rewarding, even if you know Meredith's music. This one is especially captivating! I am a few days late for the Chinese New Year, but then this is music with a kind of timeless quality. 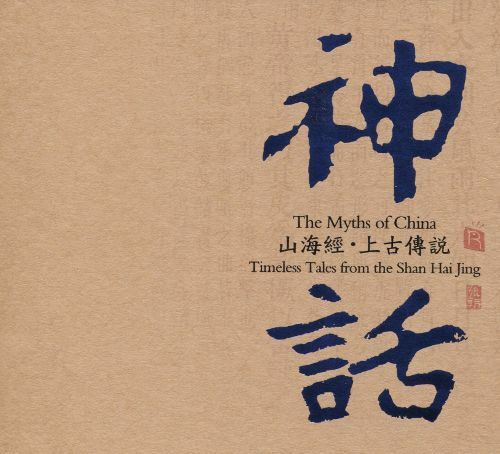 Hence the title, The Myths of China, Timeless Tales from the Shan Hai Jing (Rhymoi Music). 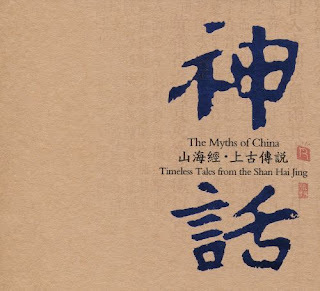 The title generally translated as Tales of Mountain and Sea, the Shan Hai Jing is a collection of mythical events and mythical geographical locations which reached its final form in the early Han Dynasty (206BC-220 AD), which in turn succeeded the Qin Dynasty as the second imperial dynasty of China. Zhang Zhao is responsible for the music on the album,. Some 11 tales are arranged for traditional Chinese instruments, full orchestra and choir, taking traditional pentatonic Chinese strains and fleshing them out into a symphonic program that delights the ears for its expressive beauty, neither exactly modern nor Western as much as tradition inspired. If Ravel were Chinese, this might be what his "Daphnis and Chloe" might have sounded like. That is an oversimplification, yet there is a myth-into-music mystery about it all, and Ravel's work might be the closest Western equivalent. The audio quality is impeccable, the music and performance in their own way exceptional and the booklet with illustrations of the myths and a few in English translations is quite stunning. This will bring to you an enchanted world, a mythical sonic adventure of the highest sort, and a telling example of what traditional-modern Chinese newcomers are doing these days. An individual modern American composer of character, Sergio Cervetti brings to us a new anthology of works in the chamber mode, Sunset at Noon, Six Works in Memory of (Navona NV6072). The theme throughout is of loss. It often dwells in realms of social consciousness, on questions vital to our contemporary world. "Some Realms I Owned" (2010) for solo piano is based on a poem by Elizabeth Bishop, "One Art," and is in memory of a friend who succumbed to cancer. It is expressive and eclectic with romantic, minimalist and modernist elements conjoining to memorialize the person now gone. "And the Huddled Masses, Clarinet Quintet" (2015) is alternately elegiac and tumultuously energetic, nicely honed, slightly bitter, in memory of unwanted immigrants and refugees. There is no topic more urgently contemporary. "Ofrenda Para Guyunusa" (2011) for harpsichord is dedicated to a Charrua Indian who was captured in Uruguay in the 19th century and put on display as a living "savage" in a Paris carnival. The harpsichord enters a neo-classical territory, ironically depicting the Indian as a sort of music box figurine, devoid of humanity in a world that has repositioned the exotic as a sort of fetish object. 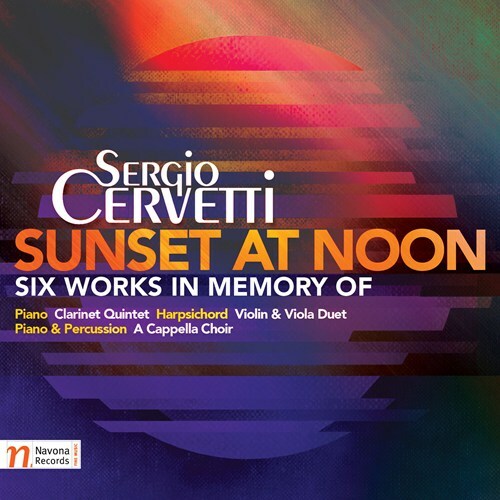 "Sunset at Noon" (1995) in four epitaphs for violin and viola is a romantic-minimalist elegiac work that remembers four of Cervetti's students who died of AIDS during the first years of the epidemic. "I Can't Breathe" (2014) for piano and percussion is in remembrance of Eric Garner, who uttered these last words while suffocating, a tragic victim of senseless police brutality. His videotaped murder helped spur on the "Black Lives Matter" protest movement. It is very rhythmic, shatteringly brittle modernism that perhaps models itself on the despair and anger of the victim and the protesters who came after. "Lux Lucet In Tenebris (Light Shineth in Darkness)" (2002) for a cappella choir is the entrance of sacred music space in an otherwise secular program, the motto of the Waldensian Church where Cervetti was baptized. It in the end offers a way through the darkness of loss through meditation and refuge, seeking the light out of the darkness. The music is markedly neo-early homophonic in mood. And so we have five sobering, pointedly life-critical tone poetry expressions that question loss and commemorate the victims and their suffering. The final work does not offer transcendence as much as it sacralizes a space where meaning and light might be found. The music moves decidedly through a hermetic series of musical worlds with feeling and high expression. In the process it looks backwards and forwards as it tries to come to terms with the terminus points we all must face. Cervetti's works analogize the anxiety of loss with a musical equivalent and a furtherance of understanding where it can be found. It is the everywhere of what remains that the music dwells within. Provocative and very contemporary. Cervetti communicates poetically yet directly. Recommended. Bernd Alois Zimmermann (1918-1970) was a high modernist of great scope and invention, a leading light of Post WWII Germany, and an adventurer who was not afraid to mix his music with avant jazz, a decidedly "impure" voice who did not always stick to the modernist script, and a composer who by now is virtually forgotten in the States. Now that Wergo is widely distributed here again we can get another good look at Zimmermann in a fine release from Peter Hirsch and the WDR Sinfonieorchester Koln, centered around his Sinfonie in einem Satz (1. Fassung) (Wergo 7340 2). The Symphony in its original version was composed in 1951 and given its premiere in 1952. It was harshly criticized by critics and later completely revised, but not without, in the words of Peter Hirsch, "[sacrificing] many of the essential qualities of the original version...qualities of sound and structure that were apparently ahead of their time in 1952." The original version was ignored for decades. Hirsch here gives us its world premier recording and a highly expressive blockbuster it is. The revisions made even before the original performance are bypassed via a return to the original score, and one hears and feels the rightness of the truly first version throughout. Hirsch notes in the liners that the entire program is meant to illustrate Zimmermann's "conception of music as the ultimate 'art of time,' in which different temporal layers permeate each other, preserving a sense of historical reference." Indeed, along with this essential work we get a fine earful of Zimmerman's early and "pluralist" later music, where tonality and atonality rub shoulders, the modern interpenetrates allusions and direct quotations of Wagner, Mussorgsky, and in "Musique pour les soupers du roi ubu" (1966) dances of the 16th and 17th centuries. The collage-montage aspect of his pluralist approach was anathema to many at the time. Now it is "postmodern" and we feel at home in the flow of time it evokes and instantiates. But most importantly a sense of "rightness" pervades. It all sounds fresh. So we appreciate the "giostra genovese" (1962), and the "konzert fur streichorchester" (1948), as Zimmermann's pioneering but also completely captivating modernist take, with or without appropriations. Whether or not you know Zimmermann's music, these are some landmark works, well performed. which give you a more complicated picture of what he was about. Erwin Schulhoff was born a Czech in 1894 and lived much of his life there. His student years found him at Prague Conservatory when only 10; studies followed in Vienna, Leipzig and Cologne, where among others he studied with Max Reger and Debussy. His Jewish heritage led to his untimely death in the hands of the Nazis in 1942. He went through in successive years of composition a post-romantic, avant garde, then a Czech folk and neoclassical phase. You can pretty much hear all periods to good effect in the new release Complete Music for Violin and Piano (Brilliant 95324). 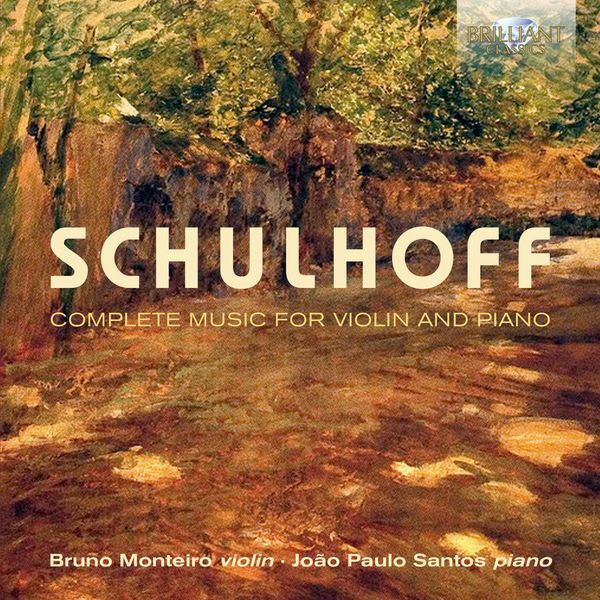 The works are played with lively spirit and idiomatic sensitivity by Bruno Monteiro on violin and Joao Paulo Santos on piano. I've heard a bit of his music previously but this particular volume is a ear-opener. 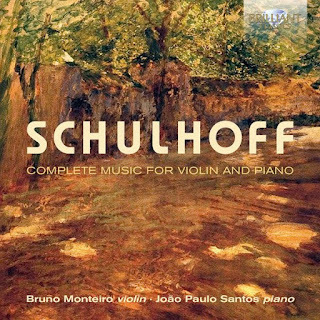 From the great character of his "Suite for Violin and Piano," the modernity of his "Sonata for Solo Violin," to the classical-folk inspiration and workmanship of his two "Sonatas for Violin and Piano" a complete picture emerges of an original voice of his times, a composer of thematic cogency and an excellent sense of flow. He may be the greatest of the composers to be lost to us in the holocaust, or certainly among the most talented. This volume spells out his brilliance. I do recommend it very strongly. 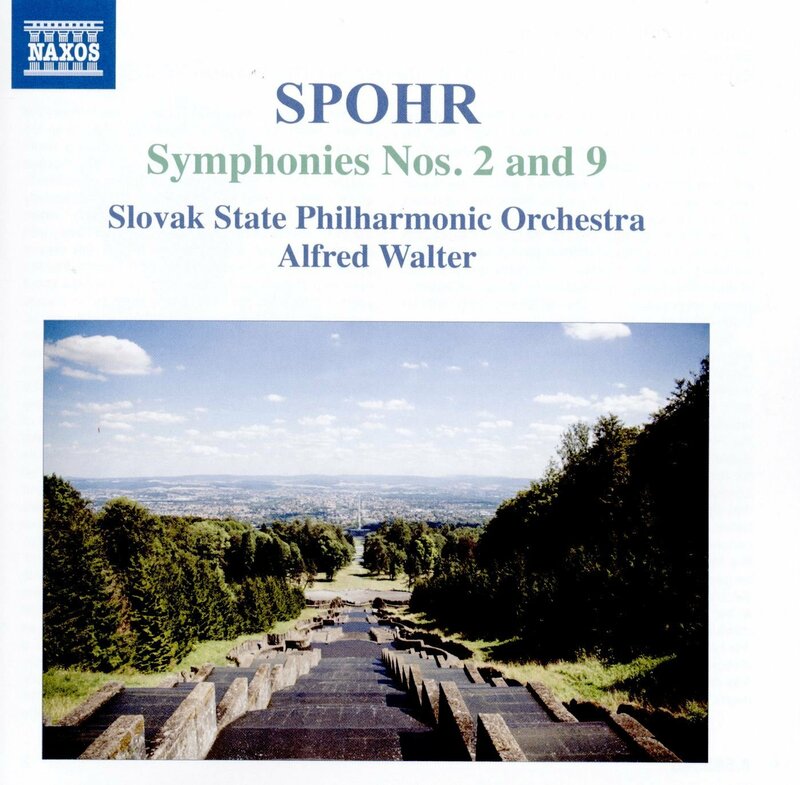 We have another volume today of the complete Spohr (1784-1859) symphonies by Alfred Walter and the Slovak State Philharmonic Orchestra. The volumes originally came out on Marco Polo in the '90s and are happily becoming available on Naxos. This one includes Symphonies Nos. 2 and 9 (the latter his last) (Naxos 8.555540). Posterity has not been very kind to these works. Compared to, say, Brahms or Mendelsson's celebrated symphonies, these Spohr works have been left in the dust. And yet it turns out these are attractive symphonies indeed, so far in my experience of the cycle anyway. His "Symphony No. 2" is an ambitious work with traces of the influences of Haydn's "London Symphonies" or early-mid Beethoven. The first movement, a minor allegro, has surprising power and gravitas. The 9th is an appealing symphony based on the seasonal cycle. It too has plenty of well planned, moving music in the post Beethovenian mode. Once again the performances and sound are first-rate. Spohr was no slouch! I look forward to more. In fact another volume is coming up for review here and I hope the last volumes as well.